Amanda Lechner is a visual artist based in New Mexico and Indiana. Lechner's studio practice primarily revolves around drawing and painting. Her current egg tempera paintings, ink drawings and installations envision and enact moments of experimentation and discovery. She utilizes traditional and from-scratch processes in her quest for narrative alternatives. The profoundly strange and wonderful ideas offered by quantum physics, alchemy and science-fiction also inform her image-making. Lechner’s work has been exhibited throughout the United States. Lechner studied painting at the Kansas City Art Institute where she was awarded a BFA with Honors in 2003 and at the Rhode Island School of Design where she received her MFA in 2005. Upon completing her education, she moved to Brooklyn, NY and has divided her time between Santa Fe, Iowa and Indiana since 2014. 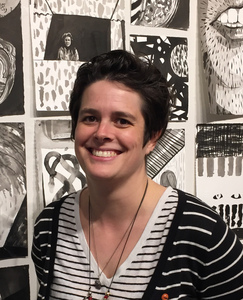 She holds the position of Visiting Assistant Professor at Indiana University, Bloomington and has been a lecturer at SUNY Purchase College - School of Art + Design and a Visiting Assistant Professor of Painting and Drawing at the the University of Iowa. She has also ben an Artist in Residence at the Penland School of Crafts, the Wassaic Project in New York this summer at Skowhegan School of Paintng and Sculpture. As an independant curator she organiziedSTATIONTOSTATION at IU, Bloomington in 2017, and in 2012-13 co-organized a traveling visual art exhibition featuring the work of 21 artists entitled “In Search Of…” that traveled to Rhodes College, University of Kansas and TSA Gallery, Brooklyn. She has also organized pop-up exhibits in New York, Santa Fe and Iowa City as well as recurring studio visit groups in NYC and at the Wassaic Project in New York State. As a current NASA - JPL Solar System Ambassador Volunteer Lechner is creating programming that bridges Art and Science to raise awareness about our Solar System.